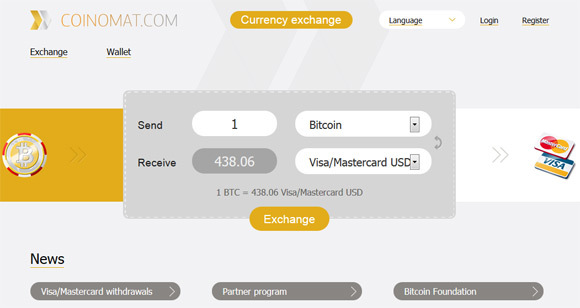 Coinomat, a quick and easy crypto currency exchange that supports BTC, LTC and PPC exchange has announced that they have implemented support for withdraws to VISA and Mastercard credit cards and Visa Electron/Maestro debit cards will not work apparently. The transfer is made in US dollars, if your card is denominated in another currency the funds will be converted into the card currency by your bank using the bank’s exchange rates. The transfer of funds to your card takes 2-4 business days to complete and note that there is a withdrawal limit of $2500 USD per one card per week. No word about a fee for the service, though there is most likely some fee associated with the service, but it is probably automatically calculated and deducted from the price you get cited per coin. Note that the service has been available for a few months already, they launched in Beta in November last year. Recently a similar feature was recently announced by BTC-e exchange. The common thing between the two is that there seems to be some sort of a Russian connection, though both exchanges do seem to remain quite anonymous in terms of where they are based and who is operating them. So this raises the question should you trust these “anonymous” exchanges by sharing your credit card information with them in order to be able to take advantage from the convenience to exchange crypto currencies and get the money directly in your card. One of the most annoying issue that Cryptsy alternative crypto currency exchange had was the minimum number of coins that you needed to have in order to be able to execute a trade. Sometimes mining for alternative crypto coins you could easily get something like 0.00123456 from a given crypto that you were not able to sell and you had to keep it on the exchange or buy more coins and then sell after meeting the minimum coin requirement. So good news if you were annoyed by the minimum order quantities that were a bit too high for some coins anyway. The only requirement now is the order total to be higher than 0.00000010 and the minimum fee for any order cannot go below 0.00000001. This could lead to some “higher fees” with very small trades, but then again you will not have to be bothered by some alternative crypto currencies with very small amount in your account balance anymore. We have finally cleared our account from a few of these such as the very little CAP that we’ve had left for quite some time. Atomic Trade is a relatively new and still not that big crypto currency exchange that has a bit different approach compared to other traditional crypto trading websites. Here you are stimulated to be active on the exchange in various ways and you get rewards for being an active member, including using the chat functionality of the exchange. And unlike other chats on crypto exchanges that are essentially trollboxes with not much of useful or helpful information, on Atomic Trade you can actually find some help and useful information from other members. You can even meet and talk with the exchange admin as well as some pool operators all while you are trading some crypto coins on the exchange itself. The crypto currency exchange Atomic Trade does support trading of multiple currencies, including some newer and not so popular that you can hardly find on other decent exchanges. Among the standard BTC and LTC trading here you can also trade XPM, FTX, WDC, BLC, HBN, PXL, LOT, MED, FRK, SKC, UNO, VTC and ATP. 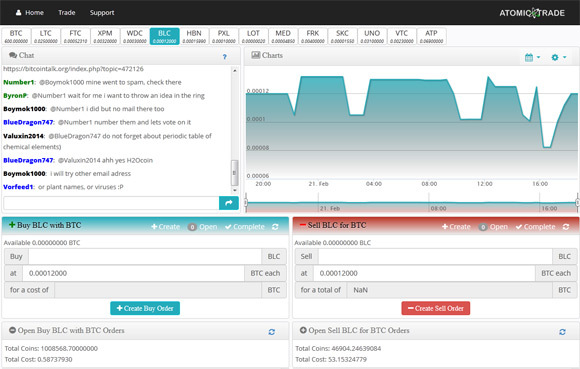 We have discovered the Atomic Trade exchange while looking for good exchange for trading BlakeCoin (BLC) and since that we kind of liked it a lot and started trading other cryptos there as well. The ATP or Atomic Trade Points are the so called bonus points that you get while trading and generally being active on the exchange in various other ways, but the interesting thing with these is that aside from trading them on the exchange for BTC, while they are in your account balance they bring you profit from the trading fees collected by the exchange. So in a way the ATP are something like shares in the exchange that bring you dividends, and every 6 hours you get your bonus based on the amount of ATP you currently have in your balance. We really like the community that is forming at the Atomic Trade and would definitely recommend you to try it out, especially if you are trading alternative crypto coins such as BlakeCoin (BLC) among others.